1. Having turns or windings: "The flexuous bed of the stream." 2. Curving, winding, or turning. 1. The state of being flexed (as of a joint). 2. The act of bending a joint; especially, a joint between the bones of a limb so that the angle between them is decreased. 3. A curve, turn, or fold; such as, a bend in a tubular organ: "A flexure of the colon." 4. 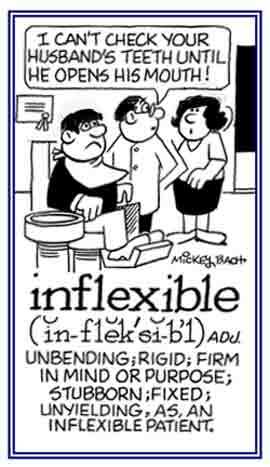 The act or an instance of bending or flexing; flexion. You may break [me], but you will not bend me or I may break, but I will not bend. 1. To bend the right knee to the floor and rise again as a gesture of religious respect; especially in a Roman Catholic or Anglican church.BR> 2. To bend the knees and bow in a servile manner or to express a servile attitude. 3. To be servilely respectful or deferential; to grovel. 1. An act of bending the knee or touching it to the ground in reverence or worship. 2. An attitude; a gesture: involving, like prostration, a profession of dependence or helplessness, and therefore very naturally adopted for praying and for worship in general. 1. To change the form of a word in accordance as required by the grammatical rules of a language. 2. To modulate (the voice). 3. To apply inflection to (a word). 4. To recite or display all or a distinct set of the inflections of (a word); to decline or conjugate. 5. To bend; to turn from a direct line or course. 6. In botany, to bend in. 1. Deviation from a straight or normal course. 2. To change in the form of a word (usually by adding a suffix) to indicate a change in its grammatical function. 3. The patterns of stress and intonation in a language. 4. Modulation of the voice; change in pitch or tone of voice. 5. The process or device of adding affixes to or changing the shape of a base word to give it a different syntactic function without changing its form class. 6. The change in the shape of a word, generally by affixation, by means of which a change of meaning or relationship to some other word or group of words is indicated; the affix added to produce this change, as the -s in dogs or the -ed in played. 7. A bend or angle. 8. In mathematics, a change of curvature from convex to concave or vice versa. 1. A reference to being incapable of adapting or changing to meet another person's demands: Margarete's busy schedule made her quite inflexible that day, so she couldn't go out with her friends for lunch. 2. Firmly established and impossible to change: The football coach had inflexible rules for his team to follow. 3. Unyielding in purpose, principle, or temper; immovable: Mr. Henderson was a man quite established and inflexible in his habits. © ALL rights are reserved. The strong return of light that occurs when its rays strike suspensoids; such as, dust particles, whose diameters exceed the light's wavelength. 1. To cast back light, heat, sound, etc. from a surface: The mirror reflected the light onto the wall. 2. To reproduce; to show: Hank's followers are reflecting his views regarding what to do in the financial conditions that exist at the present time. 3. To throw or to cast back; to cause to return or rebound: Sara's bitterness regarding her recent divorce reflects gloom on all of her family. 4. To give evidence of a person's quality or character; to show proof of a feature or attribute of something: The grade Ingrid got on her final examination in her history class reflects well on her abilities. 5. Etymology: from Latin reflectere, "to bend back" from re-, "back" + flectere, "to bend". © ALL rights are reserved. 1. The image of something as reflected by a mirror (or other reflective material). 2. A fixing of thoughts on something; careful consideration. 3. A thought occurring in consideration or meditation. 4. An unfavorable remark or observation. 5. The return of light, heat, sound, etc., after striking a surface. 6. In anatomy, the bending or folding back of a part upon itself. 1. Of, relating to, produced by, or resulting from reflection. 2. 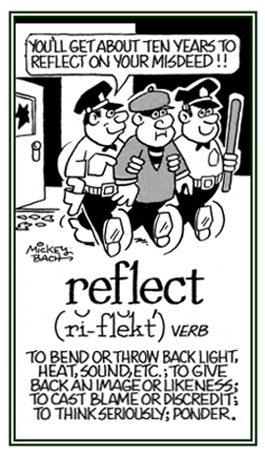 Capable of or producing reflection: "A reflective surface." 3. Characterized by or given to meditation or contemplation; thoughtful. Inter-related cross references involving word units meaning "bend, curve, turn": diversi-; diverticul-; gyro-; meand-; -plex; streph-; stroph-; tors-; tropo-; verg-; vers-; volv-. Showing page 2 out of 3 pages of 43 main-word entries or main-word-entry groups.